The year 2016 also marks the bicentennial introduction of non-native wisterias into the United States. Chinese wisteria was brought to the US from China in 1816 for horticultural purposes, followed by Japanese wisteria in 1830. With attractive, pleasantly scented flowers, non-native wisterias continue to be popular additions to landscapes and gardens across the region. Wisteria species tend to prefer moist ground, are shade tolerant, and are found with the greatest abundance in the Southeast. 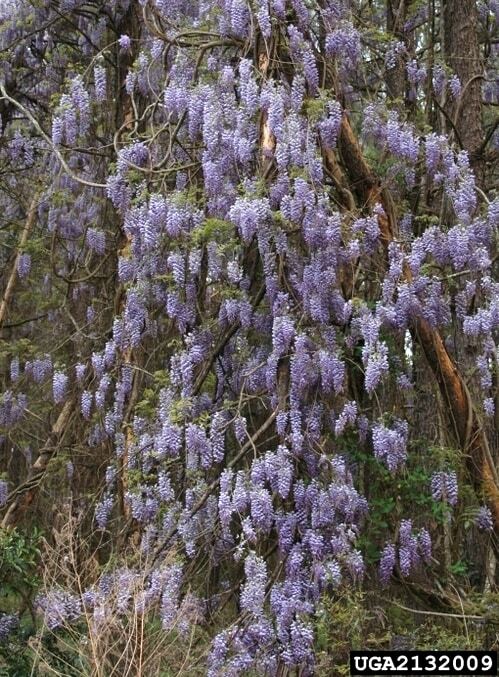 As of February 2016, 27 states and the District of Columbia had reports of one or both of these invasive wisteria species. (EDDMapS.org). Keep an eye out for these plants, which may start blooming in the Mid-Atlantic as early as late March and into late April. Wisterias are woody, twining vines, with stout gray-brown stems, often with fine white hairs. 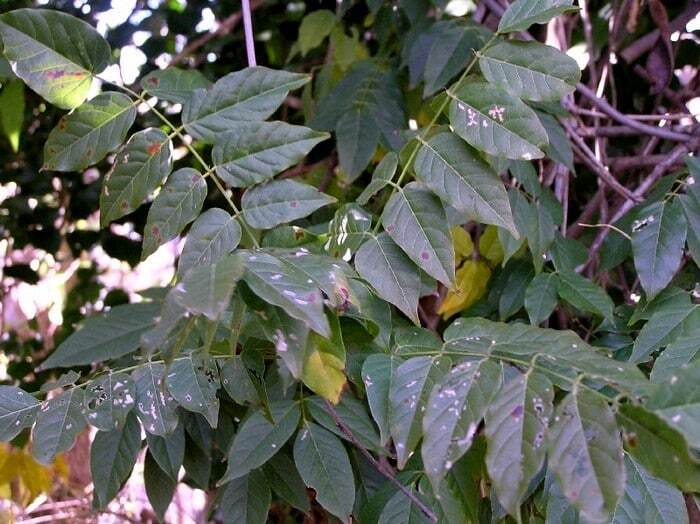 The leaves are alternate and compound, and can be almost a foot long with wavy-edged leaflets, 7-13 in Chinese wisteria, and 13-19 in Japanese wisteria. Wisteria flowers are lavender to blue-purple, borne in pendulous clusters 4 to 20 inches long and 3 or 4 inches across. In Chinese wisteria, all the flowers in a cluster bloom at the same time. Japanese wisteria flowers are “indeterminate,” which means the lower flowers in the cluster open first, and blooming progresses along the cluster from base to tip. Wisteria fruits look a bit like large, brown velvet lima bean pods. They are 4-6 inches long, narrow to a point at both ends, and are constricted around each of the 1-8 seeds. What’s so crazy about wisteria, you ask? Well, there’s a lot to straighten out here. 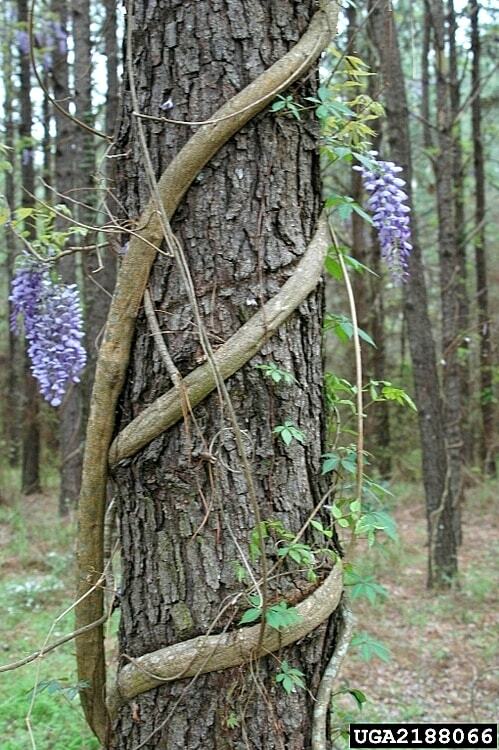 Individual wisteria plants can have a 50-year life span and reach 70 feet in height, thought to be limited by the height of the trees they climb. Each plant relies on wrapping around trees and plants to climb vertically. With time, these wrappings can become tight enough to cut through tree bark, girdling and killing limbs or entire trees. 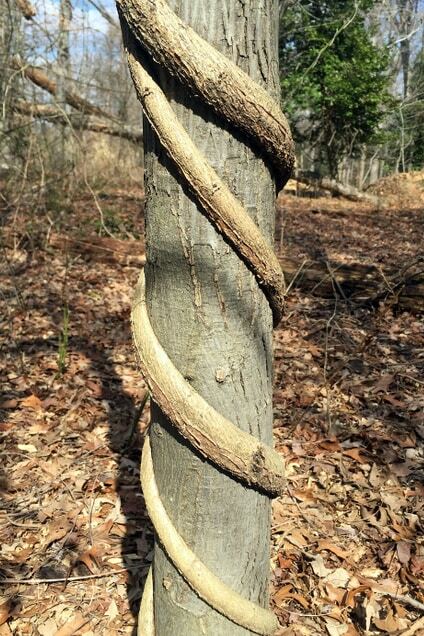 These plants use a process called circumnutation to guide stems around other structures, eventually developing an extraordinarily tight helix shape around anything they can grab onto, like a Boa constricting its prey. In addition to physical stresses, the non-native wisterias can entirely engulf trees, blocking available sunlight until the tree is no longer able to grow. Trees lost to these stressors leave gaps in the forest canopy, allowing additional sunlight to reach the forest floor, which can stimulate the growth of dense thickets of wisteria. New vines can sprout from seed or through vegetative reproduction of existing runners. The most common way to distinguish wisteria species is the direction of their twining. When viewed at eye level, Chinese wisteria stems ascend a tree or other support diagonally up to the right. Japanese wisteria spirals in the opposite direction, ascending diagonally up to the left. Another way to look at this is from the ground, in which case Chinese wisteria twines clockwise like the hands on a clock and Japanese wisteria twines counterclockwise. Japanese wisteria also tends to have more leaflets per leaf. All parts of these plants contain a glycoside called wisterin which is toxic if ingested. Consuming just a small handful of seeds can cause a slew of symptoms termed “wisteria syndrome,” with effects lasting up to a week. These include serious nervous system and gastrointestinal effects including delirium, confusion, dizziness, incoherent speech, sweating, headache, vomiting, and gastroenteritis. Seed pods begin to appear on wisterias soon after flowering and can persist on the vines until the following spring. 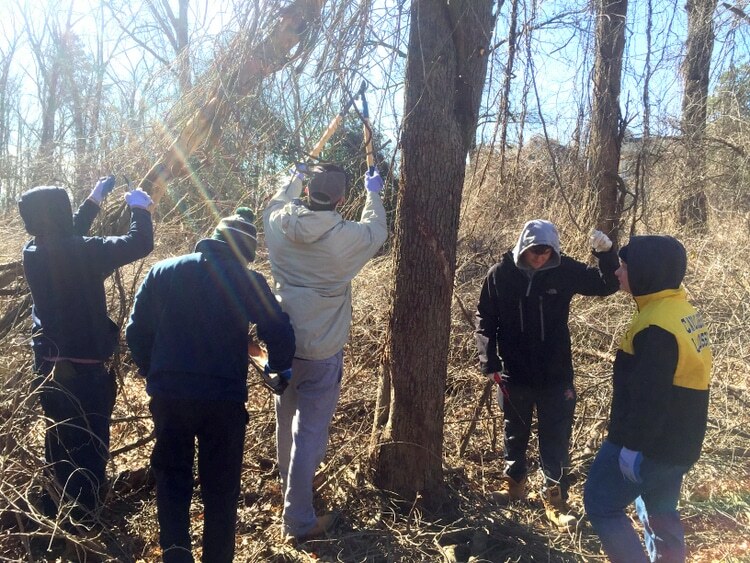 For more information about other Invasive Species of Concern in Maryland, visit the Maryland Invasive Species Council﻿. Weed Risk Assessment for Chinese and Japanese wisteria and hybrids. Maryland Department of Agriculture. Chinese wisteria. Plant Conservation Alliance, Alien Plant Working Group. Japanese wisteria. Plant Conservation Alliance, Alien Plant Working Group. Wisteria floribunda, W. sinensis. USDA Forest Service. Invader of the Month terrestrial plant. permalink.